Four UCF graduate students piece together lost World War I stories from inside the shoes of their new heroes. 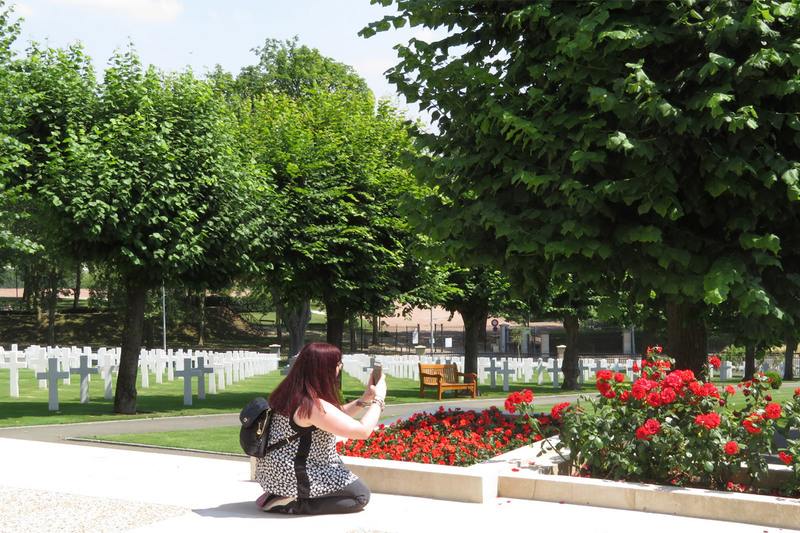 Graduate history student Kayla Campana ’15 takes photos at the Suresnes American Cemetery near Paris, France, as part of the UCF Veterans Legacy Program team. None of the past 100 Julys in France can compare to July 2018. A family in Nantes became the first in the world to move into a 3D-printed home. Around Paris, temperatures were 10 degrees warmer than normal. People throughout France stopped everything, or at least slowed down, to follow the national soccer team on its run to the 2018 Men’s World Cup title. In the middle of all of this, four UCF graduate students completed their own journey of historic impact. 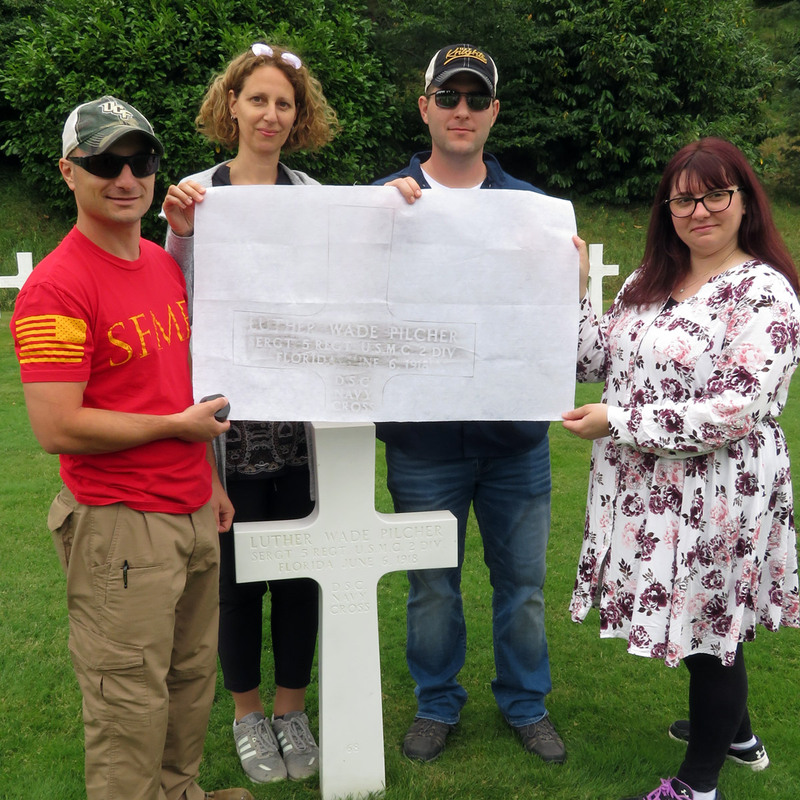 Graduate students in the UCF Veterans Legacy Program James Stoddard ’16, Marie Oury, Walter Napier ’15 and Campana, display a headstone rubbing at the Aisne-Marne Cemetery, near Reims, France. Even Amelia Lyons, professor of history and director of graduate programs for UCF’s history department, didn’t see this kind of impact coming when she first helped the university become both a partner and a poster child for the National Cemetery Administration’s Veterans Legacy Program. In May 2017, she led a group of about two dozen UCF students and 150 seventh graders to the Florida National Cemetery in Bushnell, Florida. For the UCF students, the experience was the culmination of bigger project in which they’d spent a semester writing biographies about specific veterans who had served the United States during World War I. (The stories can be found at vlp.cah.ucf.edu). Campana was among the UCF students in the cemetery that day. To say it was a moving experience is a huge understatement. Humbling. Profound. Eye-opening. No one can come up with just the right word to describe moments like that. And they all have a hard time explaining what it’s like to take steps through the cemeteries that the American Battle Monuments Commission, with help from the people of France, keep so immaculate to honor the American soldiers to whom the French are still deeply thankful. 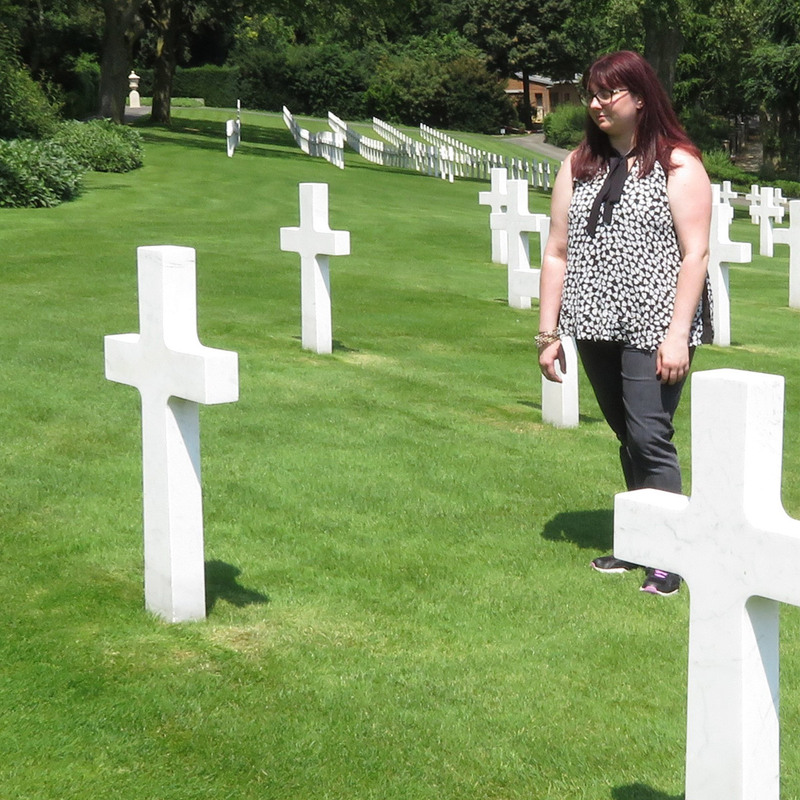 Campana looks at the Cromwell sisters’ headstones in Suresnes American Cemetery. The academic plan was to take photos and coordinates for an app that brings up the student-authored biographies and so each memorial can be found on maps for generations to come. But something immeasurable also happened in those cemeteries. While the students paid respects over the gravesites of the very people they’d written about, they began to mentally fill the blanks in those stories that until now have never been told — exactly 100 years after the war ended. Lyons has personal reasons for leading the Veterans Legacy Program. And what about Campana? She went to France to get a stronger sense for the service of the two nurses she’d been researching, but didn’t hold out hope of finding where they were buried. Twins from an upper-class home in New York City, they’d gone overseas to work on the frontlines. While leaving for home on a boat along the Garonne River at the conclusion of the war, they jumped overboard. So Campana was not prepared for what she found at the American Cemetery in Suresnes, just outside Paris: the names of the nurses on gravestones, resting side by side. Now, in the 100th year since World War I ended, Campana and her peers want to bring life back to the stories that have been lost.